Young research scientists are taught to repeat their experiments many times to see if they get the same results every time, because verification of truth in science is established when anyone and everyone gets the same results. We can take pictures on the surface of the planet Mars because electromagnetic radiation behaves the same way on Mars as it does on Earth. I believe that Christianity has spread over the entire surface of the earth, not because every event in the Christian literature can be repeated, but because of the consistency in the understanding of the events and teachings. A simple example is the fact that the Ten Commandments and the two summarized by Jesus apply very well to human life in the world today. When obeyed they produce better lives. The death and resurrection of Jesus cannot be repeated today, but the assurance of forgiveness associated with it is vital to successful civilization today. A famous physicist by the name of Paul E. Sabine once wrote the following in his book, Atoms, Men and God1:“Jesus declaration of a God of love can only command acceptance in so far as it can be verified in the inner experience of men and women and find objective expression in their lives.” A summary of what he is saying is that the validity of what Jesus taught is in the fact that his followers consistently lead better lives. They have problems like everyone else but are better able to cope with their problems. I found that to be true in my life as a scientist and a Christian. I have been a Christian my entire life, but in recent years I have been struggling with the question of what there is about my life that would make my view of Christianity different from that of others? Then it occurred to me one day that when I was a research scientist at the General Motors Research Laboratories in the 1950’s and 60’s, I was doing research in a new field of science called materials science. It is the study of the behavior of atoms in solid materials and it required me to develop an unusual perspective. I had to look at the behavior of billions of atoms and find explanations for why they were doing what they were doing. In 2009, I wrote the book Christ’s Team: A 21st Century View of Christianity based on my observations of Christianity in the current world. 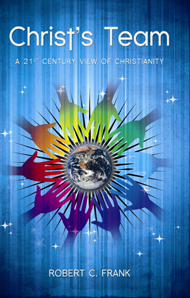 It provides answers to questions that most Christians never ask, questions like “Since God is our creator, why is what these Christians are doing important for the creation of an improved civilization on earth?” When you see how this viewpoint makes the whole story of Christianity fit together, it is a remarkable story. The recent PBS documentary about the Mayo Clinic produced by Ken Burns and his associates is a reminder of the teamwork between science and Christianity that has often moved civilization ahead in large steps. A team of doctors consisting of William Worrall Mayo and his two sons Will and Charlie started a small clinic in the once small city of Rochester, Minnesota in the late 1800’s and were aided in their work by St. Mary’s Hospital, that was built and managed separately by Franciscan nuns. The documentary provides an opportunity to compare medical facilities as they existed in the 1800’s with medical science in the 21st century. It shows clearly that God’s creation of civilization has been continuing and often dramatically. Today the Mayo Clinic Hospital in Rochester involves a 2,207 bed hospital with 115 operating rooms located on three campuses. The documentary also showed how important teamwork was for their achievement. Originally, the doctors maintained the Clinic and the nuns maintained St. Mary’s Hospital separately but worked together so closely that it seemed like they were one unit. Over the years, the doctors at the Clinic were noted for their exceptional compassion for their patients and treated them as their number one concern.